Hello friends! While refinishing furniture can be time consuming and hard work, it is well worth it when you see the outcome and know that you have created a custom piece of furniture for your home. Today I am sharing an easy tutorial for how to paint furniture. 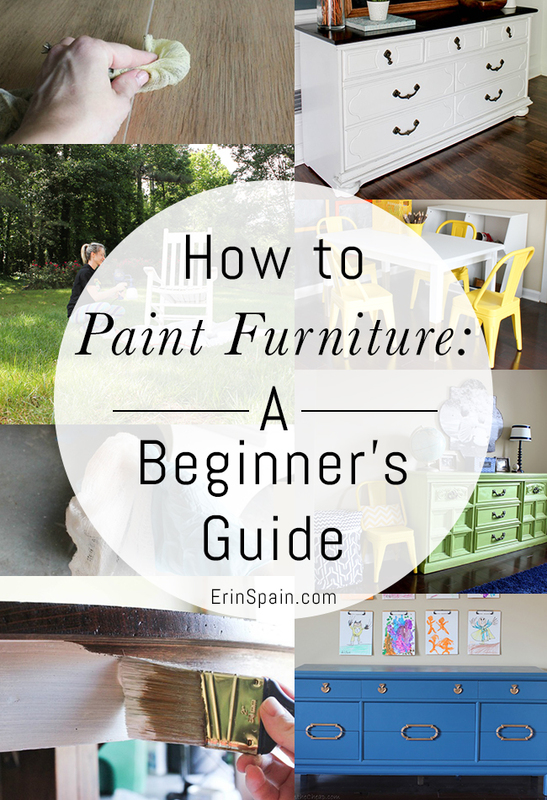 This is a very basic “beginner’s guide”—or Furniture Painting:101. Although I have learned a lot about painting and refinishing furniture, I wasn’t always all that knowledgeable. I have painted several pieces for my home, and most of them I did totally WRONG! I know it sounds like it should be so simple – you just grab a paint brush and paint, right? Nope! If you want a professional-looking finish that is going to last (that’s the key – you don’t want it to start chipping and peeling away), then there are a few guidelines that you need to follow. Although there are many furniture refinishing techniques, today I am going to cover just the absolute basics of painting. I realize that some of my readers are furniture painting veterans, but many of you are not. This guide applies to real wood furniture – I will talk about painting laminate another time. Step 1: Prep, prep, prep! works great and it’s safe for furniture. Remove all drawers before painting and work on those separately. should be fine. (I use fine-grit between paint coats.) If you are painting as opposed to staining, there is no need to strip the finish or sand it down to the bare wood. Simply removing the glossy finish will suffice. If the surface is already dull, you can skip this step. , and they also offer it in a spray (which I haven’t tried yet, but plan to!). I’ve heard great things about it. Oil-based primer is also great for furniture. Now that you have your piece primed and ready, it’s time to paint. For furniture, I use interior latex paint, usually in a semi-gloss finish. I recommend anything that’s not a flat finish. (It will show every fingerprint and flaw and will be harder to clean.) The glossier the finish, the easier to clean. Paint thin coats, and I will repeat: sand between each coat! This step is very important if you want to achieve an even finish. I normally paint 2-3 coats total. , or even regular spray paint (just get a decent brand! ), a brush, or roller. I usually use a small foam roller on the main parts of the furniture and a brush in the hard to reach crevices, painting the crevices first. The roller helps prevent visible brush strokes. because it is extremely easy to use. (I like the Satin finish.) I really prefer to use a water-based topcoat though like Minwax Polycrylic. It’s easier to clean up and there aren’t as many fumes. is awesome, and I’ve heard good things about other brands as well. You just wipe it on (I use cheesecloth to apply it), let it dry for 10-15 minutes, and then buff it with a clean cloth until you get it as shiny as you want it. This is what I used on my dresser. After you’ve sealed your furniture, I recommend leaving it alone for a day or two before using it or touching it. It would be a shame to cause damage to all of that hard work by handling it too soon! Add your hardware, and you’re done! You can also distress the piece if you’d like, or just leave it as is. The dresser in the photo was just slightly distressed using fine grit sandpaper. I distressed it after my last coat of paint and before applying my wax. I hope this tutorial has been helpful for you! If you have any questions about how to paint furniture, please feel free to leave a comment and let me know. Feel free to explore my Project Gallery here. Questions? Comments? Let me know! I love hearing from you. this is beautiful. You are amazing!!! I love the shape of the photograph you have of your children. What is this called and where did you get it done? I have been looking for different ways to display our Wedding photos and this is perfect. Thank you! It’s a quatrefoil. I made it and you can find a tutorial here: https://www.erinspain.com/quatrefoil-photo-wall-art-tutorial/. Erin, have a question, what if a dresser has already been painted over. I have a black dresser, I want to paint off white. How should Kim approach this? Also the drawers of this dresser has glitter and up raised patterns of paint on them, definitely would sand those, right? Any ideas would be appreciated. Sounds like a very interesting piece of furniture! 🙂 A couple of options: You don’t necessarily have to strip the existing paint off, as long as you can sand it and then prime it. (It may take a couple coats of primer – and they make special primers for painting over dark colors.) Now, with the glitter issue – if you can’t get it sanded smooth (try a power sander if necessary), you might want to consider stripping that part. There are lots of paint strippers on the market, and I’ve heard great things about a particular product called “Smart Strip” that will remove several layers of finish. The most important thing is to get the existing paint job sanded so it’s all even, otherwise your new paint job is not going to look even. You want a smooth finish in the end. Hope this helps! Hi Monica! You can do that, however I have found that mixing the stain with glaze allows it to dry more slowly so you can wipe it and blend it better. I did it to my boys’ dresser using this tutorial: http://www.sweetpickinsfurniture.com/2011/01/how-i-glaze-furniture.html. I didn’t even end up using a topcoat because the glaze is pretty durable and it has held up really well with two boys playing with toys on it, etc. Hope this helps! Excellent tutorial! It’s so hard to follow all the steps when you are excited to see the finished project but it’s worth it! Thanks Sarah! Yes, it is definitely hard to be patient when you just want to see it finished. I love the transformation…looks really pretty with the black and white! Thanks for giving all the instructions!! Thank you very much! I used Benjamin Moore’s White Diamond Semi-Gloss paint, and Minwax brand Ebony stain for the top. If you go to the Search box in my sidebar and type in “Refinished Dresser Reveal,” you will find a post specifically about this dresser and it walks you through everything I did and every product I used. Hope this helps! Good luck with your furniture redo! 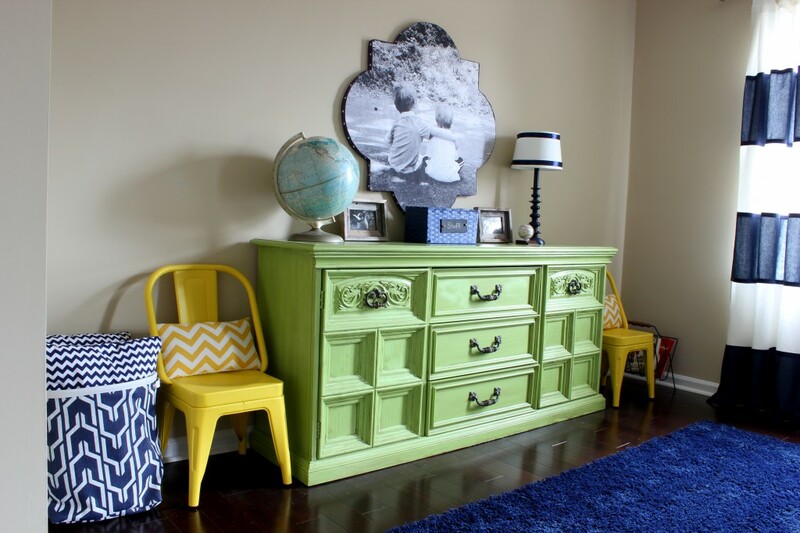 Erin–LOVE LOVE LOVE what you did with your dresser!!!!! Thank you so much LeAnn! Keeping with what everyone else has shared… Thanks again and again! The tips you’ve shared will come in super handy this weekend. The hubby and I are repainting our mantle. Thanks so much! Good luck with the mantle. I’d love to see how it turns out! Great advice! And, yes, a sprayer cuts the time by more than half. It also achieves a really nice, even finish. Thanks, Kristopher! Just recently got a sprayer and I can’t wait to use it for a project. I’ve played around with it some and love it so far! I would like some advice. My Daughter of 8 yrs has a white bunk bed. She has decided to go with a touch of gold in it. I have sanded some of the white off to give use an antique look. Please could you tell me how to finish this off with the gold look? Hi Linda! I have tried the Martha Stewart metallic paint and like it a lot. As for the primer you mentioned, I haven’t tried anything like that, however I do know that if you use chalk paint instead of latex then there is no need to sand or prep the surface. There are several brands that offer chalk paint (not to be confused with chalkboard paint) and you just seal it with a wax. This is a very good question, and actually a great idea for a blog post. I’ll try to post one soon. There are a few ways you can tell if it’s real wood. The first good indicator that it is real wood is the weight. If it’s super heavy, it’s probably solid wood as opposed to particle board or laminate, etc. Also, if it’s laminate, it’s not going to have any visible wood grain. Another good indicator of real wood is dovetail construction. Slide open a drawer and look at the side of it. Are there tongue and grooves where the drawer meets the drawer-front? If so, it’s solid wood. Are there varying patterns of grain visible all over the piece? Can you feel the grain? It’s probably wood. Veneer can sometimes have grain but it’s usually the same pattern repeated over and over. Also, if you look at the side of the piece, you will be able to see where a sheet of veneer is attached to the wood. Also, look under the piece and see if it is unfinished wood or veneer. Veneers are often covered from top to bottom. Now, all of that said, you can paint anything. If you are planning on painting as opposed to staining, you can paint veneer, laminate OR wood. Just be careful sanding veneer as you do not want to damage it. If you’re painting (not staining), you don’t need to strip the finish, simply sand, prime and paint. Hope this helps! Please let me know if you have any other questions. For clarification: with veneer piece that has been painted, it is ok to sand the top coat of pain? We just bought a piece off of craigslist for our dining room and were excited to simply install. As we moved it, light bumping caused the pretty cream colored paint to scrape off and reveal black paint underneath. Then, just putting dishes on it did the same. We clearly need to repaint. It seems the paint is pretty fresh. (We noticed the smell when we got home, so let it sit for 4 days before any attempt to put it in the house.) So, can we just sand the top coat, or do we need to get to the original veneer and then sand? Did you paint your hardware? I often spray paint hardware but for this piece I left it alone. Hi – just finished my first DIY project and used your site as a guide. I painted a French provincial dresser white, spray painting the hardware black. It came out beautifully. A week later I am ready to move it to my daughter’s room and notice it has yellowed quite a bit. I did use the Minwax Wipe On Poly you recommended for light/white furniture. Any suggestions? Since the room we are using it in has black and stark white fabric I definitely cannot leave it yellowed. Thanks for your help! I can’t wait to move on to project number two! Oh no! Sorry for the misunderstanding. Please see the paragraph called “Protect” toward the end of the above post. I recommend not using polyurethane on white furniture because it will cause it to yellow. I only use polyurethane on colored paint or stain. For white furniture, I either allow it to cure for 30 days or wax it (Minwax finishing paste in “natural” is a great choice). If I were you, I would sand it to get the glossy poly finish off, give it another coat of the white, let it dry thoroughly and then wax it. Just apply the wax with cheesecloth, let dry 10-15 minutes and buff with a clean white cloth. Then leave it alone for at least 24 hours before moving it! Hope this helps, and sorry your furniture yellowed! Thanks for the clarification. I am reading you post and taking notes. I plan on painting a wood dresser white this weekend. I’ve already started sanding and have plenty of paint left. My next stop is for Minwax finishing paste!! Thanks again. Please let me know how it turns out! I’d love to see a pic when you’re done! Very nice, thanks for the great explanation! Erin, do you sand even if you use spray paint? I was thinking of trying a high quality spray paint for a desk I’m going to refinish. If there are no brush strokes, is sanding between coats still necessary? Hi Jenna! I would defniitely sand before priming and spray painting, but I don’t believe it’s necessary to sand between coats aside from just touching up any drips that may have dried. Hope this helps! P.S. Please excuse my typo! 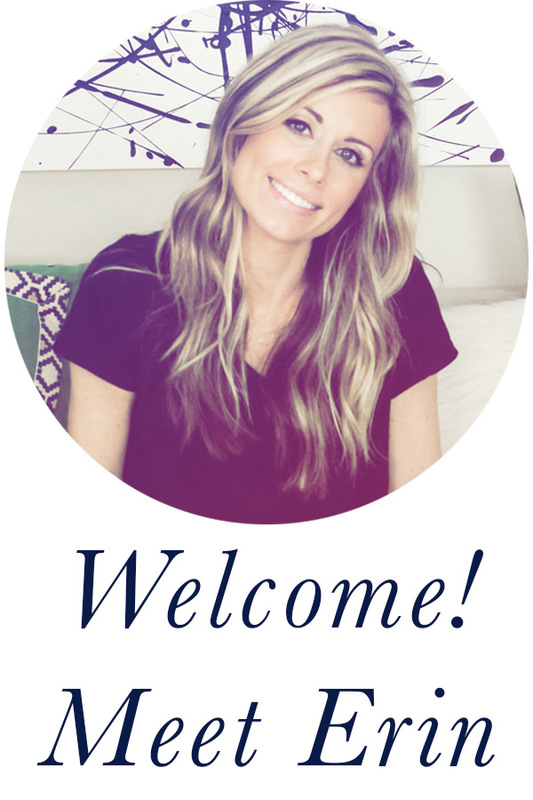 Hi Erin, Thanks for your website! I am going to paint an old table/coffee table. I have sanded it, primed it but now I’m dumbfounded about how to get small containers of paint. I want to use about six different colors but all the paint store has are quarts or gallons. They do have some small samples but they are not a semi-gloss and the paint man said they might fade as they’re used to put on your wall and paint over when you decide which one your want. Any ideas where to get small amounts of semi-gloss paint? Unfortunately aside from samples, I’ve never seen it in less than a quart. The only other option I can think of is sometimes there are super cheap cans of paint in the “oops section” at the hardware store which people have returned or decided they didn’t want. You could always check there to see what colors are available, and keep in mind you can always mix your own! Grab a few colors and blend them to get a shade you like. Hope this helps! Oh, thanks that’s a good idea to check paint store for rejects. Also, I realized that some artists’ acrylic paints might work so I’m going to check at my local art store. I would just have to be sure to seal it well with a non-yellowing sealer as some of the colors will be light. Thanks! We’re always learning! Hi Erin, Great post thank you for the instructions! I have a quick question, I have an Ikea dresser which i want to paint white – it is currently black/brown. If i sand it do you think that will be ok or will i need a paint stripper? Hello! You will not need to strip it. Sanding is fine, just be sure to use a good primer! Thanks Erin, I am in Canada Toronto – what is a good primer do you know? I use Kilz but have also heard that Zinsser is good. I bought Zinsser, hopefully it works well.. Thanks! My wardrobe has a laminated finish. Yes, that is a large thin piece of wood that is glued onto a piece of compressed wood chips. How do I paint that in white? Sanding will not be a good idea. Thanks. Hello! For laminate, you can sand it but you just have to be very careful. I would just lightly hand sand it with a finer grit sandpaper, taking special care around the edges. You just want to rough up the surface enough for the paint to be able to grab on. I have sanded laminate several times with no problem. And of course use a good primer. The problem is that if you don’t sand, the paint will not grab on and it will chip and peel off (which I have also experienced). Another option if you really don’t want to sand is to try Annie Sloan Chalk Paint. (Not to be confused with chalkboard paint.) I haven’t tried it yet but know lots of people who recommend it, and it will stick to any surface and does not require any sanding or prep. It is a little pricey but from what I hear, it’s well worth it. Hope this helps! I’ve found Lots of necessary information from your blog. Just bookmark your blog for more explore! I will definitely share this post with others. Thanks for sharing. Hello, thank you so much for this blog. I have been wanting to repaint my daughters dresser white, that is currently painted black. It actually looks just like your dresser, but I believe it is plywood, or some other form of wood. Would I follow the same instructions that you gave to Sri, since its not real wood? Yes, I would recommend sanding lightly and use a good primer. You may need a couple coats of primer since you’re painting white over a dark color. Be sure to lightly sand between coats too. Hope this helps! Hello! Sorry for the delay. Somehow I missed your comment! I would use a wood filler on the spots where laminate is missing and then lightly sand the whole thing smooth. Follow with primer and paint. Hope this helps! để cho một bản thiết kế nội thất văn phòng, nội thất gia đình, nội thất trẻ em đẹp điều đầu tiên bạn cần có là các mẫu mã nội thất gia đình, văn phòng , trẻ em đẹp là điều bạn cần , vì vậy online 360 cung cấp cho các bạn ,gia đình , công ty bạn các mẫu mã đẹp tiêu chuẩn để tạo cho một bản thiết kế nội thất gia đình, nội thất văn phòng, nội thất trẻ em tuỵêt vời. Hi, I was wondering if you need to paint in a certain temperature? It’s getting cold in the northeast and I’ve been wanting to paint some items but I’m not sure if the paint would crack. Also, where do you usually do your painting? Outside or inside? Thanks! Great tips for beginners like me! Hello! It is important that you paint when it’s not too hot or cold. There are temperature guidelines on the paint can which you should follow for proper application. I typically paint in my garage, but I live in the South where it doesn’t get super cold. Sometimes I paint inside the house, especially if a piece is way too heavy to lug in and out. Hope this helps! I want to paint black over black. Are all primers white? Also what about scratches? Sand them out? fill? They do make tinted primer which is gray, and it is especially for use with darker paint colors. If you go to the paint counter at someplace like Home Depot or Lowes and explain what you need, they can match you up with the right primer for the job. Hi! Quick question: I’m considering painting a dresser I have that is very wide but relatively short… It has lots of drawers and I also don’t own a sander– just regular old sandpaper! Should I bother painting it or will it be so time consuming that it won’t be worth it? Hello! Yes, you can paint it. I’ve hand sanded most of my furniture. You can use regular sandpaper or a sanding block (a few bucks at the hardware store). You don’t have to sand the finish all the way off, you just need to rough it up so the paint has something to grab onto. It doesn’t have to be perfect. Hope this helps! Good luck! Thanks so much! Do you know approx how long it will take/ how long it took you guys? sorry for so many questions! It will take a few hours total but I usually spread out the work over several days to account for drying times, etc. So I’ll sand and prime one day, then sand and paint a coat, then sand and paint a second coat, then seal. So it might take me almost a week from start to finish if I break it up like that, working for maybe an hour each day. You want to lightly sand between coats and allow to dry completely between coats. If you work for several hours each day you could probably knock it out in a weekend. Seeing the photos before and after the painting, the dresser has been done younger. Before,it was sad and with old aspect and later I see that it is nice and with bright colours. Did you look for this? Hello! 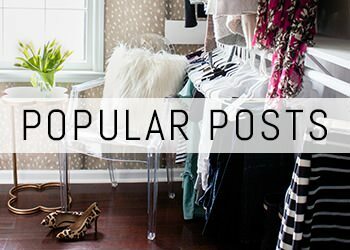 I found this blog post through a Google search because I’d like to redo my bedroom furniture which I found at a second hand store. I think it’s beautiful and adds a lot of character to my room and it will be a dark brown color. I have two questions for you. First question – how do I sand those hard-to-reach places? There are a lot of grooves and indentations in my furniture and I’m not quite sure how to access them. Second question – is Murphy Oil Soap all I need to clean the furniture before I begin the sanding? Thank you in advance for your answers and thank you SO much for this post! Thank you for stopping by! As for the hard to reach places, I usually use a small sheet of sandpaper and hand sand the crevices as best as I can. Don’t stress if you can’t get into every tiny crevice, and if it’s not perfect, that’s ok. The main thing is to just rough up enough of the surface to give your paint something to “grab” onto. And as for cleaning – yes, Murphy’s Oil Soap will do the trick. If the piece is already pretty clean and in good shape to begin with, then I usually skip this step altogether. Hope this helps! Would it be possible to add a shopping list of the items you used and the qty based on general dimensions, i.e. Hi Jasmine! Here is a link to this specific dresser where I mention each product (brand and color) that I used, etc. : http://diyonthecheap.blogspot.com/2012/03/refinished-dresser-reveal.html. If you still have questions or need more specific info, let me know and I’ll try to add it! Thank you! You are right on! The secret is in the prep and lightly sanding between coats. I did a bed and dresser last summer. My first attempt and it was great. One thing I did…I use Sherwin Paint most of the time for everything because I like the store I go to. Anyway, it was recommended to use the “old” oil base paint that is “self-leveling”. It takes more time because of the drying time between coats, and ventilation, ventilation, ventilation. But, the results were amazing. The finish looked professionally done! I plan do do more odd pieces, but of course, not over do. One can only have so many painted pieces! Thank you. Oh, now I am so sad. Following Home Depot instructions for painting bedroom furniture I bought flat paint and semi-gloss poly. I have already done 2 coats of primer and 2 coats of the flat paint (Gliddon’s White on White). Ugh. Would you use the wax on flat paint or should I use the poly? FYI It does need one more coat of paint. Ohhh DON’T use poly over white paint, it will turn it yellow! Definitely use the wax and then buff it with a soft cloth until it’s as shiny as you’d like it to be. Not sure why they told you that, hmm. Maybe it was a newbie who didn’t know what they were talking about! LOL. Anyway, use the wax and it should turn out fine. I’d love to see pics when you’re finished! Oh, the Polycrylic is different and it is not supposed to yellow. I have some but I haven’t tried it over white yet. You should be ok, but I can’t speak from experience on that one. Please let me know what you end up choosing to do! Good luck either way! Uh oh, I decided to use the wax (Minwax Finishing Paste). I put it on with cheesecloth, waited 10-15 minutes and buffed it until my arm wanted to fall off. Now it looks a little dirty/yellow in some spots. Any suggestions? Sounds like it went on too thick in some spots. I would sand those spots and touch them up if possible. To apply the wax, put a small amount on the cheesecloth, then double it over and apply it through the second layer of cheesecloth. That will give you the perfect amount. It will look like nothing is going on there but if you look in certain lights/from certain angles, you’ll be able to tell it’s going on. It should be super thin. Good luck! Hi Misty! Yes, I would definitely prime no matter what. Primer will help seal the surface and provide better adhesion. Good luck! I love to see your before and after furniture pictures. The actual gift though is to envision it done when it looks its worst..and in that you are truly gifted!! Looks so pretty with black and white ,thanks for sharing all instruction….i like and love it. This is great. Thanks for sharing this beginners guide on painted furniture and how to paint it, I have found it really useful. Thanks for this DIY step by step info. This will be my first time ever doing a project like this. I am painting a dresser I have had since child hood for my baby. He will be born this year! Thanks for stopping by! Congrats on the baby. I’d love to see photos when you finish your project! Great tips. I am about to embark on painting our nightstand and will certainly be following your procedures. Thanks for sharing! Thanks Lin. Good luck with your project! I am a new DIY-er so I don’t have a lot of experience with painting furniture. My daughter has a beautiful, old fashioned bedroom set with a headboard/footboard, nightstand, and dresser. The paint on it is flat with gold leaf trim. I wouldn’t repaint it except that it is a dingy grayish green (used to be white). I actually want to keep the original coloring on it but want it to look fresh as I am completely redecorating her bedroom. I have no idea what kind of paint is on this furniture. It could be lead-based (gasp!) for all I know. It was given to us by her grandma and was actually HER grandmother’s. Can I follow the normal steps of sand/prime/paint, etc. or do I need to do something else? Can I (or should I) take a paint chip somewhere to have it tested first? Thank you! I love your blog by the way! I hope that some of my projects turn out half as wonderful as yours! Hi Mindy! It’s very possible that your furniture does have lead paint, but the good news is it’s easy to find out. Most hardware stores (Home Depot, etc) sell lead paint test kits which allow you to find out for sure. You can ask them at the store or search their website for it. If it does in fact contain lead, you can either have an expert do the removal for you or you can very carefully do it yourself. (Here’s a helpful link: http://www.ehow.com/how_5163033_remove-lead-paint-furniture.html). Just be very careful as you can release the lead dust into the air. Now, if you find out that the furniture does NOT contain lead, then yes you can follow the usual process of sand/prime/paint. I’d love to see photos when you’re done! Hope this helps. Thanks for getting in touch! Ok, so much for that idea. When I approached my husband about painting the set, he said “no way”. They were his great grandma’s, they are antiques, etc. I think it’s more of a sentimental thing. So ok, he wont let me paint them. *sigh* Since I am not in the market to buy a new set in the color I want, do you have any suggestions? My daughter wants a hot pink and zebra room. The furniture is a dingy grayish color? I could probably cover the headboard/footboard with fabric and not inflict any damage on the wood but as for the rest of it… I am at a loss. Any suggestions would be much appreciated. Thanks! Bummer! But I understand. What about adding some funky hardware/drawer pulls? This is something that can easily be changed back to the original later on. And yes, fabric on the headboard would be a good (and temporary) fix too. I’d love to hear what you end up doing! Good luck! Hi Emily! No, you do not have to put a topcoat on if you don’t want to. You can let it cure, but it takes about a month for paint to cure completely. This means leave it alone – don’t put things on top of it, etc, for about a month. Another option is to use furniture wax to protect the finish. You can buff it to your liking – the more you buff, the juniper it gets. Hope this helps! Hello! You will have to strip the paint off first. You can use a product like CitriStrip or Smart Strip. Here is my tutorial on that: http://diyonthecheap.blogspot.com/2012/08/how-to-strip-furniture.html. Then you can condition the wood and stain it. Hope this helps! Good luck! Great site, I tried to read all the comments to determine if this was already discussed, so here goes, When sanding, did you “hand” sand, or did you use an electric sander with fine grit? Hello! I hand sanded but you can certainly use a sander. I would hand sand at the end to distress it though if you plan on doing that. You have much more control that way. Erin have you tried chalk paint? There is no need to pre-sand. Makes life so much easier and the look far exceeds any other painting techniques. Hi! I haven’t tried it actually, although I do have a sample pot of it that I still haven’t used. I do love the idea of chalk paint and plan to try it sometime but I like the look of latex paint too plus it’s cheaper. Thanks! Gerçekten çok güzel, yaratıcı ve çarpıcı. Tam bir başyapıt. If you plan on using your dresser highly, use quality hardwood that will be able to withstand the usual wear and tear and will not scratch easily. However, if you find that you will not be using the dresser often, you may opt to use wood options that are more affordable albeit a little less durable. I painted a dresser BM White Cloud color matched to Olympic no-VOC eco-friendly paint. Would you recommend just letting the paint cure if the painted furniture is going in a baby’s nursery? I notice that on my wax it says it has the harmful chemicals known for birth defects. I usually love to wax but want to be on the safe side! Hello! You could let it cure if you’re not going to be using it for at least a month. Just give it a good 30 days without touching it or putting anything on top of it. However, wax is ok too. There are chemicals in it so if you are pregnant, I would recommend having someone else apply it for you. But once it’s completely dry and aired out, it should be fine in the baby’s room. Another option which I just used for my sons’ headboards is Polycrylic. I used Minwax Polycrylic topcoat and I believe there’s also one called Safecoat Acrylac. It’s supposed to stay true to color and not yellow like polyurethane, and it is low-odor and water-based. Hope this helps! Oh bummer! I usually don’t paint the sides of the drawers for that reason. Maybe you could sand them? Hi do you paint the back of the dresser? I definitely agree with you–I try to keep beautiful wood (esp. if a piece was built pre-WWII) unpainted. My faves to paint are the mass-produced mahogany pieces from the post-war era. Only because there are so many out there, and they tend to be rather ugly. Love your cabinet!!) Do you mind if I link back to this post at some point? A link back would be fine! Thank you! You can use polyurethane if you get the right product and apply it correctly. Polyurethane needs to dry in very thin coats. I could write a wall of text describing the process but I just wanted to chime in and let people know that it is very much so an option (the best in my opinion) even on white pieces. Thanks so much for your input! I may have to give it a try sometime. I haven’t tried this. I would be careful of anything that will leave deep scratches on the surface as those will show up after you paint. If it is intended to sand, then it should be ok. Let me know if you end up using it! I’m interested in knowing how it goes. Hi Erin, thank you so much for this post! I was wondering if you could help me. If I was doing this on an extreme, extreme budget, what would you say are the most important things to buy/most important steps? Thank you! Hi Rebecca! I would say sand and prime! You could skip the topcoat as long as you let it cure for a month without setting anything on top of it. Also, if you are on an extreme budget, check the “oops paint” section at the home improvement store. There is a section where they deeply discount paint that is returned or that they mix but don’t end up selling. I’ve found super cheap paint that way! Good luck. Hi Erin! My name is Tomeka and I wanted to know if I could sand my table and chairs inside my apartment. I’m well aware that the staining has to take place in a well ventilated area but is sanding inside okay? I’m not sure if my fiance is trying to discourage me from doing this project, he keeps expressing to me that sanding inside isn’t an option because of the debris. I plan on hand sanding so should this eliminate some of the “kick up”? I really had my heart set on this project. Someone gave us the table and chairs but its a little drab and doesn’t flow with the rest of our furniture but with some TLC it’ll have life again AND compliment the rest of my furniture. Hi Tomeka! If it helps any, I actually just painted two pieces of furniture that were too heavy to haul downstairs and outside so I did everything inside, including sanding. (I even used an orbital sander on some parts). My main advice is to use large drop cloths to cover the surrounding area, definitely wear a mask, and a shop vac will come in handy too if you have one. You are right about the staining though – this part needs to happen outside or in a very well-ventilated area. Hope this helps! I love your dresser, I too have some old furniture I am looking at up-cycling. I have been reading and have found a paint that you dont need to do anything except paint on..Anne Sloan paint, has any one used this, its seems quite expensive, but perhaps the expense is worth not having to sand and prime???? Hello! Yes I have heard of it and I even have a sample pot of it that I have not yet used. I know a lot of other bloggers who absolutely love this paint, and yes it does eliminate the need to sand and prime. This paint is awesome for the shabby chic look, although with sanding it afterwards you can achieve a more modern look as well. You do need to apply wax on top, but it’s a great paint. A little bit goes a long way, so although it is pricey it does last a long time. Let me know how you like it if you end up trying it! I wish I could say there is a completely painless way – but it will take some work. There are a couple of options. First, you could just try sanding it all off or at least until it sands smooth with a power sander (I use an orbital). Second, you could just strip it all off with a product like SmartStrip or CitriStrip and then scrape the paint off. Once you get the paint off or at least get it sanded smooth, be sure to prime it! Then you can apply your pretty white paint. Good luck! Let me know how it goes! I just painted a dresser with black Valspar Eggshell paint and it is very tacky after sittin for 3 days. Will this sticky feeling go away? If not, should I sealit with something? I’d like to be able to put things on it and not have them stick to it. Hmm, it definitely shouldn’t be tacky by now. Did you paint it with thick coats? If so, it might just take longer to cure. It can take up to a month for paint to fully cure on its own but it should at least feel dry to the touch by now. I would give it several more days and see what happens. If not, you could try a polycrylic or polyurethane topcoat, but normally its best to add those after paint is no longer tacky to the touch. Also, thin coats of paint produce best results! I put 2 coats on. I guess they were thick, but I wouldn’t think that it would still be sticky. Do you know what might happen if I tried to use one of those topcoat products on top of sticky paint? Would I create an even bigger mess???? I would say it’s worth a try, because otherwise your best option is to sand or strip the paint off and try again, painting thin coats and letting them dry completely in between coats. If the topcoat messes it up, you’ll have to strip it off, which would be the case anyway. So I say go for it and hope for the best! There’s a decent chance it will fix the problem. I wouldn’t go for a wax though. I would do a polyurethane or polycrylic. Keep in mind you’ll also have to let the topcoat cure for a few days just to be on the safe side. Good luck! Let me know how it goes! Great post!You are super inspiring! I have a question about how much to sand a piece of furniture. I am doing an old dresser and was only hoping to rough up the old paint and thin it right down enough to apply a fresh new coat of paint ( So i could skip the priming and such) but upon sanding, the old paint is chipping in areas, now I feel that I have to sand the entire thing down to the wood, Is this completely necessary? Thank you! No, it isn’t necessary to sand down to the wood. As long as you can sand it smooth enough to where you can run your fingers across it and it feels smooth, you should be fine. (Right now you can probably feel the texture where it’s chipped, and you will see that if you apply paint.) Roughing it up a bit is fine, although I usually prime too just to help the new paint adhere better and last, as well as blocking stains. Hope this helps! Beautiful work, its amazing what you can do to make a piece of furniture really personalised. Customised furniture is very popular, as it gives your home a wonderful unique look. I have a question. I have a old dresser with a round mirror, it has been painted before so I just want to lightly sand to smooth and repaint. 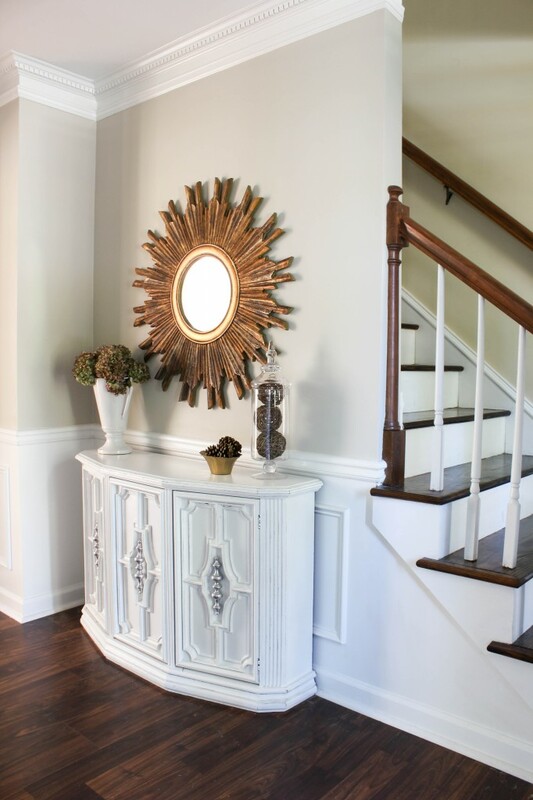 My question is how do I apply a differnt color paint to the crevises on the rounded corners and the carved round mirror frame? I am painting the dresser beige and want to highlight the indentions with a light brown. I like what you did with your dresser, look very nice. Hi Sanya. Thanks for stopping by! I would use a glaze for this. They sell Valspar tintable glaze at Lowe’s which I have used before. I tinted it with stain and kept it well-mixed, but you can also tint it with dark paint. You just wipe it on and then wipe it off, just like stain. It settles into the crevices and brings out the detail. Hope this helps! Thanks Erin, that sounds like a great idea, very helpfull. I will try that. a silly question but Erin how do u avoid thumb n fingerprints from coming on the wood paint …and you should sand once paint is dry right??? You have to let it cure completely or add a protective topcoat. If you are letting it cure on its own, then don’t touch it for about a month. (That’s how long it takes paint to cure.) Or you could add a topcoat like wax or polycrylic or polyurethane. Don’t sand the final coat of paint, but sand lightly between coats. Hope this helps! Yes, it is my understanding that you can. Just not the other way around (oil-based paint over water-based primer). I have a black coffee table with an off white design on top. I want to paint the table a creamy white but I’d like to have the design remain and perhaps tint it a different color. how would I tackle this? I’d have to see a pic to really envision what you are describing. To tint the design, you could always use a tintable glaze. I’ve used Valspar brand before. As for painting the white over the black – just use a really good primer first. Hope this helps! I have a dresser and bed that I’ve already painted once for my daughter and I sanded didn’t prime but painted pink w silver glitter. Now I want to repaint it but I want it to have a gloss finish could you tell me what I would need to do? We are either painting it white or pink again with glitter. The reason we are redoing it is because pieces of it look bad. Would I need to sand it the paint was never waxed over or anything like that. And if we paint it white do we need to wait 30 days to wax it? If you are just touching it up and repainting it with glitter again, then I wouldn’t bother sanding. If you want to get rid of the glitter, then I’d sand everything smooth, prime and paint. You don’t need to wait 30 days to add wax. The 30 days is just how long it takes the paint to cure on its own if you aren’t adding any sort of topcoat. I’d wait 24 hours then wax it, or polycrylic or polyurethane or whatever topcoat you choose. Good luck! Amazing, one if the most helpful and informative posts ever! I cannot wait to paint my chest of drawers, yours looks so vintage, I love it!! Hi great post! I have a question…. I bought this little dresser for cheap and it was black and thought i would repaint it, but i didn’t know about all the steps that you describe in this post so i just washed the surface areas and then painted it with an acrylic paint. Then when i was done i noticed that it peels very easily and then i found your post and realized i did it all wrong…. Is there any way i can fix it without starting over…like just sealing it or something? Please i need your advice! Oh no! Unfortunately I don’t know of a way. I would either sand it all down or strip the finish off using a chemical paint remover like SmartStrip or Citri Strip. I’m sorry! Good luck! Hi Erin! Thanks so much for the great info and step by step tutorial! I just finished painting a dresser using your steps above (sanded, primed, sanded, primed again, sanded again, painted white, sanded, painted white) and I now that it’s dry, I noticed that the texture looks a little spongy. I used a paint roller with a 1/4in nap (and was told by the Home Depot employee that it is meant for semi gloss to hi gloss finishes on cabinets/doors/furniture). Will the furniture wax or poly finish smooth it out? Or do I sand again and try a different roller? I can’t imagine another roller will eliminate the spongy look. Other than the texture, it looks great and I’m confident in the quality. Any advice is appreciated! Thank you! I would definitely wait until you are happy with your finish before you add a topcoat, as it will not minimize roller marks or brush strokes. Make sure that your roller is for “smooth surfaces” – you also might want to check out a product called Floetrol that helps eliminate roller marks/brush strokes. For now, I would sand again and try a smoother roller possibly with the Floetrol. Is there a certain finish (satin, matte, glossy, etc) or type of paint (brand,etc) that you recommend? When I can find the time, I am going to be repainting a coffee table as well as a buffet piece. Both are currently black so I know I will need to sand and prime first, but I get stuck trying to figure out which paint to buy. I recommend semi-gloss for furniture and I love Sherwin Williams and Benjamin Moore brands. (Just personal favorites.) Good luck! Hi Erin. I didn’t realise that primer is so thick and looks ugly after paint. Will it look better after sanding? I am painting the drawer off silver to match my bed sides made in manufacture. How to achieve glossy finish? Manufacture ones look a like have laqued slightly. You will want to just apply a thin coat of primer before you paint. It should not be thick. If you want a glossy finish, you can buy a paint with a “gloss” finish and add a glossy poly topcoat. Hope this helps! Hi Erin, thank you very much for your comments. Hi Eugenia! I have never used polyurethane spray before, only the wipe-on. I would say to carefully follow the instructions on the can. Spray thin coats to avoid drips, and shorter sweeping motions are usually better than continuous spraying. Good luck! Please let me know how it works out! Thank you for the step by step and the tips! Just want to say thank you for keepng your step by step directions so user friendly to us (I mean me) that are a lttle intimidated when it comes to painting furniture. No problem Kelly! I’m glad the tutorial is helpful. No need to be intimidated – you can do it! What an impressive job and great instructions. I have a chair I’d like to repaint. The chair back has some carving. I am wondering if sanding is enough to get the paint off this area or do you recommend I try to remove the paint. I’ve never done anything like this before and I’m a bit afraid to get started! Thanks Myrna! Sanding should be plenty. If you are just re-painting I wouldn’t worry about stripping the previous paint off. Just sand as best as you can, prime and paint, applying thin coats and sanding between each coat. You’ll do fine! I have not read all the entries in this blog, so I hope I’m not rehashing old topics. I have a small chest of drawers that looks like it was done last with a solid stain (brown). I want to paint it and stencil the front (will also replace the old wooden knobs with porcelain or ceramic. Of course, I’m interested in the base refinishing suggestions, but also some leads on the stenciling would be very helpful. Thanks in advance for your input. As for painting the base: As long as you sand it enough to dull the finish and use a good primer, you should be fine to paint it following my tutorial. As for stenciling, I have used stencils from both Royal Design Studio and also Cutting Edge Stencils and I love the selection from both companies. Each of their websites have great tutorials for stenciling. I have stenciled a rug and found it easiest to stipple the paint on with their stencil brush, however on furniture I found it easiest to use a small roller and use rolled up painters tape on the under side of the stencil to hold it in place. Hope this helps! Hi Erin, I’m painting some bedroom furniture gray. I bought one of those paints that has primer in it. Do you think that will work without priming? Also, I like the hardware the piece originally had, but not the color of it. I bought some spray paint (yellow paint), but am not confident painting it will work since it’s metal hardware and will obviously be touched a lot. Is there a finish you would recommend? Finally, there is a lot of scroll work that is etched in the piece. I’m planning on painting that with a brush, but do you have any particular tips on keeping the appearance inside the scroll work smooth looking? Hi Anna! The paint and primer in one would probably work ok, although I usually always apply a thin layer of plain primer first just to be sure no stains will peek through. I have used just the paint and primer in one on a previously painted piece and it worked fine. As for spray painting the hardware, you should be fine as long as you use a spray primer first. I have spray painted hardware before and it’s holding up fine so far! As for the scroll work, I would use a tiny artist’s brush to get in the nooks and crannies. This will allow you to have more control as well as use very little paint so it won’t form big globs or drips. I painted a dresser black with 2 coats of a latex based paint. I was told to put Minwax Polycrylic clear protective finish as a final coat to protect finish. First, do you agree with this suggestion? If yes, how long do I wait after painting furniture to apply the clear coat? Thanks for any advice you can give me. Hi Donna! Yes, you can use the Polycrylic. I really like that product actually. I would wait at least 24 hours after the final coat of paint before applying it. This article is very insightful. I haven’t started my project yet and have been researching. I am going to redo an entire bedroom set with a vanity in a two-toned fashion keeping the drawers their natural wood beauty and painting the sides and top off white. I have 2 quick questions: 1. Have you heard of or used Bulls Eye Shellac? If so can I just apply it to the wood after cleaning it? 2. I LOVE the handles that came with the set…however they have a bit of plastic on them that i’d prefer to paint white. How would I go about painting the plastic portion, or do you have a tutorial over that? Thank you! Hi Lauren! I love the two-toned look. I have never used Shellac, but from what I know it works well as a sealer but not necessarily a final topcoat and it doesn’t hold up well against heat or water. I typically use polyurethane or polycrylic as a topcoat on wood. But if you do end up trying the Shellac, please let me know your experience with it! I’m not familiar with the Bulls Eye Shellac. As for the handles, I would probably tape off the part that you don’t want painted, then use spray paint. They make formulas specifically for plastic. I would probably use a spray primer first and then the spray paint (or a 2 in one paint with primer). Good luck! Thank you so much for the tips! I came across another question i’d like to ask. In your post you state that it’s pertinent to sand in between each coat. Does this include the very last coat? The guy at Home Depot assured me that I didn’t need to buy any top coat with the paint I was purchasing. If all else fail, however, i’ll be going back and buying a can of top coat just to be safe!So sorry for the plethora of questions. This is my first project! No, no need to sand the last coat! Also, you don’t necessarily need a topcoat, but paint typically takes about 30 days to fully cure. If you choose to not use a topcoat, I would wait about a month before sitting things on top of the surface or touching it much, etc. I usually wax mine with finishing paste just for added protection. I have a question…I’m trying to paint some red old chairs white…I have sanded and applied primer ( killz ) but the red color bleeds through…should I do another coat of primer ? Yes, I would lightly sand and add another coat. Sometimes it takes a couple coats of primer to cover up a dark color, especially if you are painting it white. Hope this helps! I followed these instructions to a T and I am very proud of my first furniture re-paint project. I found a side tab,e with drawers from The Salvation Army for 8 dollars and it turned out great. Thanks Debbie! I actually used the original hardware that came with the dresser. You could check ebay for vintage hardware, or flea markets are great places to look too. For more modern hardware I love Hobby Lobby. 1. 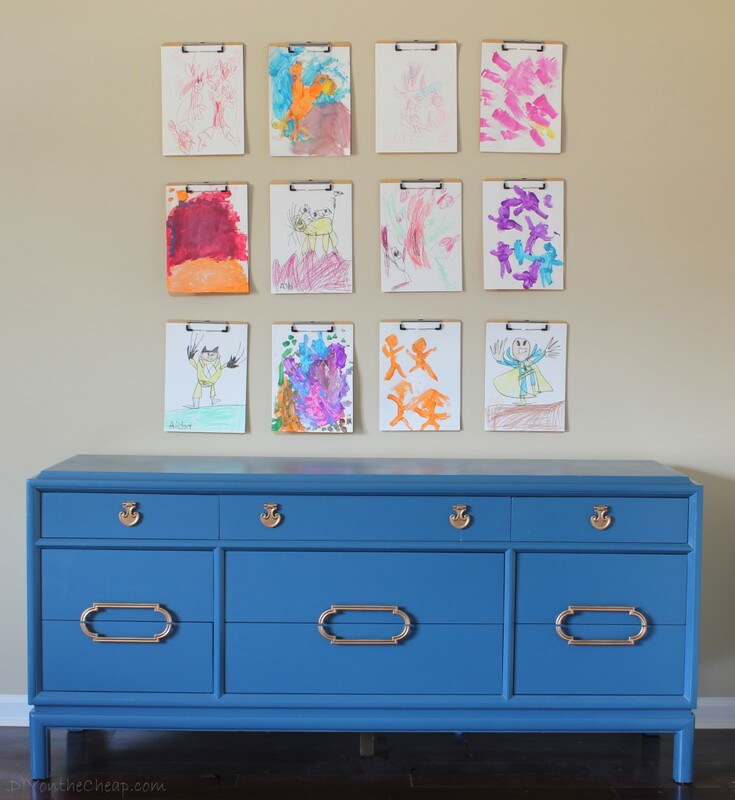 How did you paint the hardware on this dresser? 2. I have some outdoor pieces of furniture that are old, made out of a very heavy metal. They have been painted multiple times over the years. What would you recommend? Can you strip paint off of old metal? Which paint do you recommend? And should it be sealed? Thank you for sharing your talent and knowledge. Hi Terri! I actually didn’t paint the hardware on this piece. It is completely original and I just cleaned it up with soapy water. Hi, so glad to have found this site, I am going to paint my table and chairs that are now black to a bright white, was wondering if I can use a Rust-oleum clear lacquer as a sealer since poly urethane yellows on a white surface or just use the wax? Hi Teresa! I have never used the clear lacquer over latex paint, so I can’t say if I recommend it or not, although it’s probably fine. Another option besides the wax is Minwax Polycrylic which is water based and I have used it before with good results. I love Rust-Oleum spray paint but have just never used it (or their topcoats) on furniture. I definitely recommend using something other than polyurethane on white paint, and water-based is typically best over latex. Hi Erin, Just wanted to say thanks. I am just starting out with this furniture reno caper. Have just started on our “oranged” pine coffee table. Painting the lower “cupboard” an off white and staining the top…a la french country shabby chic. (well in my head it is!!) Have found this post invaluable for a beginner. Cheers! Thanks Sue! I’m so glad you found my tutorial helpful. I will say one thing to look out for when painting pine white is that sometimes knots can eventually bleed through. (This recently happened to me with a dresser.) If this ends up happening, you can seal the knots with varnish and then paint over them to keep them from bleeding through. Hopefully this won’t happen to you! Good luck with your coffee table! I’m sure it will be beautiful. How long does this process take from start to finish (for let’s say a medium sized dresser, 2 end tables, and possibly a book shelf…)? I have a few pieces of furniture I would like to re-paint, but it sounds like this might mean we won’t have any bedroom furniture for a few days! Thanks, I’m excited for the project! I have some laminate furniture too if you have recommendations for re-painting that! Hi Tara! It really depends on how much time you are willing to devote to it each day. If you plow through and work fast, you could finish in maybe 2-3 days. I usually give myself about a week because it can get tiring! I’ll sand one day, prime the next, lightly sand and paint a coat, then do the same thing the next day, and seal the last day. This way I’m only working maybe an hour or so per day. If you do it all in one day, you just need to allow proper drying times between coats, and I like to wait a full 24 hours between my final coat of paint and my topcoat/sealer. With all the pieces you are refinishing I would estimate realistically maybe at least 3 days unless you work your tail off from morning til night! 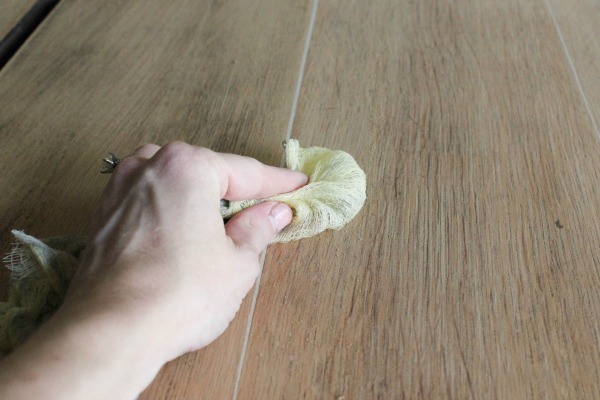 As for the laminate, you can follow the same process, just be extra careful when sanding so that you don’t damage the surface. I would just lightly sand it enough to rough up the surface so paint will “grab” onto it. Be gentle. Good luck! I’d love to see before and after photos when you’re done! No, do not sand after the last coat. As for topcoat, it isn’t mandatory but if you do not use a topcoat, it typically takes paint 30 days to fully cure on its own. So I would wait about a month before putting stuff on top of it or handling it a lot. What type of paint did you use? I know there are some oil based paints that are very durable without a topcoat, but I’ve never personally used them. Good luck! Hey lady, I’m so happy I found your site. I’m about to start my first project but just have a few questions before I start. I have a night stand that I have already sanded down. I’m planning on painting it a silver first then white over the silver but when I’m done distress some of the white so the silver comes through. If this turns out as planned I would like to do it to my book shelf as well. Do I follow the same steps even though I’m using 2 colors? If not, could you possibly give me a few pointers? How many layers for each color? Hi Dre! I would still lightly sand between coats just to get a smooth finish. (Just very lightly to smooth it out.) You should be ok with one coat of silver, but if you want a more dramatic look then I’d go ahead with 2 coats. And I’d probably follow up with 2 coats of the white just to get good opaque coverage so you can’t see the silver through the parts that you don’t distress. Good luck! I’d love to see pictures when you’re finished! Feel free to email them or post them to my Facebook page! hi i love the dresser makeover. can you please e-mail me: saim_angel@live.ca. i have old drawers but they are not real wood. i want to fix them up so they look nice in my room. Thanks for your help!…..Ms. Saima Sheikh. I just got done painting a dressers white and bought some of the mid wax finishing paste, but when I got it home I noticed it is a “natural” color for light woods. Is this what you use, or is there a clear one too? Hi Kristina! Yes, I use the natural (it ends up being clear). It only comes in Natural and Dark. I’ve used Natural over white paint and also over darker colored paints and I’ve been happy with the results. Just make sure that you apply it very sparingly! I always use cheese cloth and fold it over, applying it through a layer of the cloth. Then allow proper dry time and buff with a white cotton cloth. Hey!! I finished painting and then sprayed a finish on my white pieces. Although the finish had polyurethane in it and now some of my pieces are yellow tinted. Is there any way to fix this without having to paint all over again?? Also my piece is scratching on top even after the finish was put on. It have been left alone for a week. Thanks!! Ok, unfortunately there really isn’t a way that I know of to fix the yellowed paint other than painting over it. (After sanding to dull the finish.) I never recommend using polyurethane over white paint for this reason. Your best bet is finishing wax or polycrylic. Also, when using polyurethane on painted furniture (which I sometimes do over darker paint or stain), I always apply 2-3 coats, allowing proper dry times in-between. Sometimes one coat just isn’t enough to protect it, especially if it’s a surface that is going to see a lot of wear and tear (like a dresser-top). Also, I’ve never used a spray polyurethane on furniture before. It could just be that the type of finish you used isn’t compatible with this particular project. I’m sorry! I know this is frustrating. I wish I knew of an easy fix for you! Hi! I am in the process of using your instructions to repaint a highboy dresser and recently saw another variation of instructions that used liquid sandpaper. Have you ever used this and if so, what is your feedback on it? I am asking because I’ve been sanding my dresser for hours (still have yet to prime it) and it still feels smooth. It definitely is real wood but I believe it has some kind of veneer coating on it. Would love any insight you can provide. Thanks!! Hi Jamie! I have never used the deglosser personally but I’ve heard that other people really like it. You don’t have to sand the piece a lot – just lightly to rough up the surface a bit. You could always try coarser sandpaper if what you’re using now doesn’t seem to be doing the trick. But the deglosser is certainly a good option also! Hello & thank you for the helpful instructions, Amazing! Quick question… Approximately how long does this take to do?? It really just depends. I usually spread it out over several days – this makes it easier for me since I have kids. So, I’ll sand one evening for an hour, prime for an hour the next day, sand and paint for an hour, repeat. With dry times in between, it’s very hard to get it done in a day. I have, however, finished a piece in a weekend before if I spend the majority of my time on it. You just need to allow 2-3 hours dry time between coats. Hi Erin! Your blog is great, it has been very helpful. I wanted to get your opinion on something. I am in the process of painting a nightstand in a light grey color and attempted to use polycrylic, as a recommendation from a friend, to seal it however it turned into a disaster. I had bubbles and streak marks covering the entire nightstand, ended up sanding it all off and throwing on another coat of paint. I have read some how to blogs on using polycrylic with better results but I am nervous to try it again. I am wondering if I should just switch to the wipe on epoxy but with that I am worried about the light grey yellowing. I have also considered the wax but have read in humid rooms it can become tacky over time, have you had any experience with this? Hi Melissa! I’m sorry to hear that you had issues with the Polycrylic. What type of paint did you use? The polycrylic is water-based so you have to use it over water-based paint, like latex. I’ve never had a problem with it personally. If you are nervous about using it again, I do recommend wax over painted furniture. I’ve used it many times and I’ve always been happy with the results. It’s held up well. Just be sure to put a very thin coat – if you apply it too thick then you may have problems. I always use cheese cloth to apply it, and fold the cheese cloth over and apply it through a layer of it. Then buff it with a clean white cloth. Another option is to just let the paint cure on it’s own for about a month, and then you won’t really need a topcoat. But I know it’s hard to leave a piece of furniture untouched for a whole month! Good luck with whatever you choose! I just wanted to say thanks for giving such straight-forward easy to follow directions. I looked at many websites and just felt overwhelmed. I just refinished a set of end tables I inherited from my grandmother. I couldn’t stand the thought of getting rid of them, but they didn’t match anything in my house. I repainted them in heirloom white and I LOVE them! Thanks Jennifer! I’m so glad that my tutorial was helpful. That’s wonderful that you were able to hold onto your grandmother’s tables and make them your own! 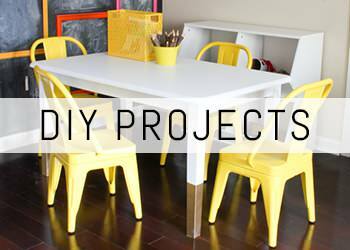 I know I’m kind of late the party about this DIY, but great post! I’m not sure if I missed this part, but I was wandering how much the entire project and materials would cost? Thank you! Thanks Rita! It really depends on what type of paint you use and how much you need, how many pieces you are doing etc. I would estimate if you had to buy all materials and didn’t already have anything on-hand, and were just going to do a dresser of this size, it might run $40-50. You should have paint and primer left over too. FYI When you put grey words on a grey background it is hard to read. Hmm, Wendy, I’m not sure I know what you are referring to — sorry. I’m not seeing any grey words on a grey background. Can you point out where you are seeing this? Maybe something did not fully load for you? Hi Jacque! You can use glaze or dark wax to get that look, and you can use sandpaper to age/distress the wood. I would distress it in areas that would naturally age over time, like edges and corners. I have also used stain mixed with glaze. Here’s a good glazing tutorial that I have used: http://www.sweetpickinsfurniture.com/2011/01/how-i-glaze-furniture.html. Hope this helps! I am wanting to re-paint a children’s table and chairs cream. It is currently purple and pink. I need it to be complete in 1 week. Can you tell me what items I will need for my ”to-get list”? Do I have to strip the current paint on it, or can I just sand, prime, and paint? No need to strip the paint off. Just sand, prime and paint. (And sand lightly between coats too!). I would get sandpaper/sander, a good primer, paint (I like semi-gloss for furniture), tack cloth is helpful to get the dust off after sanding, a paint brush and roller. I recommend waxing or Polycrylic as a topcoat. (Polyurethane can turn light colors yellow over time.) Hope this is helpful! 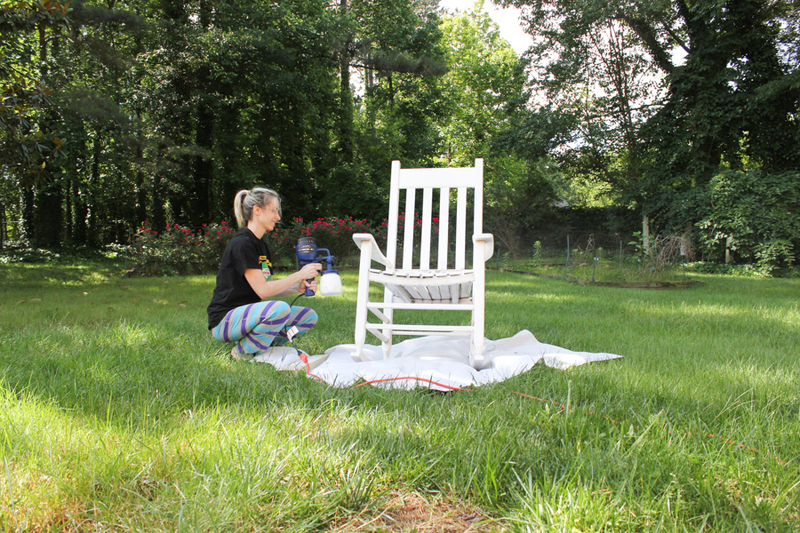 Emergency question….my husband and I are refinishing some awesome old chairs that were painted. We have done all of your steps such as sanding, priming and painting. Here’s the issue. My chairs look great but the ones my husband did have many paint drip areas. I’m trying to “spot” sand in the areas where there were drip marks. The issue is when I do that, the sand paper leaves scratch marks around the area I sanded. Is there anyway to get the scratchy marks off without resanding the whole chair? Yikes! Yes, I’ve had this issue myself. Make sure you are using “fine” or “very fine” sandpaper. Anything coarser than that will leave scratches. If you’ve already gotten scratches on it, go over that area again with the fine sandpaper. The paint should camouflage it once you add another layer or two where it needs to be touched up. Sand gently and lightly until the drips are gone! Good luck! Very nicely done. Reminds me of the furniture that I need to go paint and get restored! Great post! Been reading a lot about different tips for painting furniture like this. Thanks for the info! I have a dresser that has knicks and paint chips. Would I need to sand it completely so that the paint adheres correctly? Hi Irene! I would sand it to achieve a smooth finish, but if the knicks are deep then use wood filler to patch over them and then sand that smooth. The paint will adhere with a light sanding and priming. Good luck! Hi there! I’m hoping you can help… I painted a dresser for my daughters nursery and my husband coated it with polyurethane instead of pokycrylic and now it is very yellow. The dresser was a challenge to begin with because it is veneer- so I’m wondering how I can get the oil based polyurethane off so I can repaint without damaging the dresser itself since it can’t be sanded like wood. Can you help point me in the right direction? Thanks! Yikes! So sorry this happened. I know that veneer or laminate furniture can definitely be a challenge. You can sand it lightly, you just have to be very, very careful. I would be nervous about using chemical stripping agents, but you might be able to at least use a liquid deglosser just to dull the finish enough for paint to adhere again. You don’t have to remove the paint/poly completely, you just want to rough it up enough that a new coat of paint will adhere to the surface. 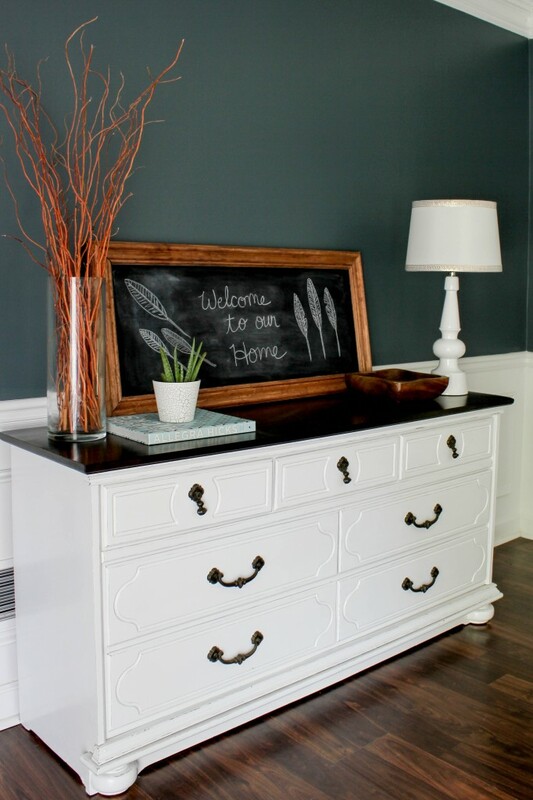 Another option is chalk paint (not to be confused with chalkboard paint), which needs absolutely no prep beforehand and can adhere to virtually any surface. You just seal it with a wax after you’re done. Good luck! Hi there, I really tried to read all of the comments so I apologize if I am asking a question already asked. What did you use to apply primer? Roller, brush? Also do I sand my laser coat of white before applying a wax or polycrylic? Thanks so much! Wonderful tutorial and gorgeous furniture! Hi Meg! I used a brush to get into the nooks and crannies and then a foam roller for the rest. No need to sand your last coat of paint before your topcoat. Good luck! Thank you so much for this tutorial. I’m currently repainting a dresser that was given to us and this has really helped ALOT! Alot of other tutorials or alot of youtube videos don’t really give you much detail on how to do this so it was alot confusing.. I did have a question though.. I know you sand after every coat of paint but does that also mean you sand the very last coat before sealing? I had just finished sanding after priming and I can’t wait for the results! Hi Jennie! No need to sand after your last coat of paint. And I’ve found that normally one coat of primer is enough. How many coats of primer is usually needed? This is a really great how to guide. You could pretty much do this with any piece of furniture that you have. Thanks for the wonderful tips. What do you know about Rust-Oleum Latex Paint? Apparently, it is specifically for furniture and can be applied to metal, wood, plaster, etc. I wasn’t sure how this compared to traditional interior latex paint as you said you used. Hi Melissa! I’ve never used Rust-Oleum latex paint, although I’ve always been happy with their spray paint and wood stain. I do have a quart of their chalkboard paint I’m planning on using at some point, but haven’t tried it yet. If you do end up trying it, please let me know how you like it! I’d love to hear about it. Erin! Thank you SO much for this tutorial! It was perfect and so helpful. I just painted my first piece of furniture…a small dresser for my baby boy! I love how it turned out. I used all your recommendations and it went so well. Thank you again! I’m so happy to hear that! Thanks for letting me know. I’m so glad that you love the results! Can I skip the primer step if my paint contains primer in it? Hi Kim! Technically, you probably can. I normally don’t use paint and primer in one on furniture just because I can get a smoother finish with really thin coats of regular primer followed by paint, but you’re probably fine. Just be sure to apply it very thinly. Nice work. I’m new to this as well, well at least new to trying to do it right. I’ve run into drawers sticking after painting. Does the furniture wax help with that? Or was I using the wrong paint or too much etc. Hi Andy! Yes, the wax will help with that as long as you let it dry completely before closing any drawers. If you weren’t using a topcoat when you ran into the sticking drawer problem, you probably closed the drawers before the paint fully cured. (It takes about a month for paint to fully cure on its own with no protective topcoat). If you close a drawer before that, it will stick. Good luck! Hi AnnMarie! 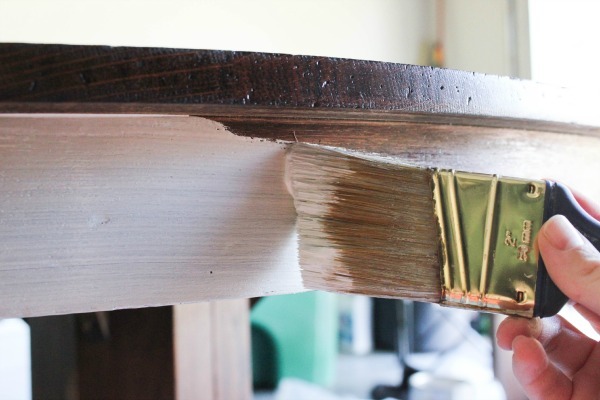 If you are simply painting the dresser, I would just give it a VERY light sanding so the paint will adhere. Be very careful as you do not want to sand the laminate off. If you are staining, you won’t be able to stain laminate/veneer, only the real wood will take the stain. Hope this helps! 1) Can we use the steps you outlined for any furniture finish and material? We have a West Elm entertainment shelving set that is dark brown and I want to paint it white. The paint finish is a bit glossy and it looks like it isn’t solid wood but rather a very nice wood composite. 2) We have a beautiful solid pine table that we bought in England. It is unpainted/unfinished, and we have enjoyed it but now I think I want to at least stain in both for protection and to give it a more finished, modern look. Do you have recommendations on what to do and if I have to follow the steps you outlined above? Hello! Yes, you can use this tutorial for pretty much any material. If you are working with laminate or veneer, just be very careful sanding as you don’t want to sand the veneer off. Just very lightly rough it up so the paint has something to adhere to. As for your pine table, here is a tutorial for staining that you might find helpful: http://diyonthecheap.com/how-to-stain-furniture-the-basics/ If you opt to paint it instead, I highly recommend using wood filler on top of all of the knots as they will eventually bleed through, particularly if you use a light color paint. Use a good primer (maybe even two coats) too! Good luck! Nice little guide. i think the hardest part is finding the right kind of paint with the right color! You don’t put any type of sealer over paint. That is begging for failure. Use an enamel if you want a hard finish. Hmm nope, I’ve done this countless times with great results. All furniture pieces are holding up great. Thanks for your two cents worth though! Let me say… You are a Saint! Thank you for sharing your paint wisdom! Question regarding sanding… which products (primer, paint, & poly)are safe to sand? I know that anything with Silica is not safe and shouldn’t be sanded. Hi Fina! Anything containing VOCs, additives or silica can pose a risk and it is definitely recommended that you wear a respirator if you are sanding anything containing these and do so in a well-ventilated area. Definitely don’t sand anything with mercury or lead (so anything painted during the 1970s or prior, I would do a lead test and have it professionally refinished if you find that it contains these heavy metals.) These days there are many safe paints on the markets such as low or no-VOC options which are safest, so I would look into those. But a respirator will provide great protection. Hope this helps! Can’t wait to try this, sounds easy enough for me! Hi, I am ready to begin painting an old piece of furniture but it has intricate details. How do I go about finishing, stripping, painting, etc. those details without destroying them? Thanks. Hi Lynn! If you are painting as opposed to staining, I wouldn’t stress too much about stripping or sanding the intricate parts. You can try to lightly hand sand it a tiny bit with a sheet of sandpaper, but it really isn’t necessary unless the finish is super glossy. You just want the paint to be able to adhere to the surface. I usually use a small artist’s brush to get into the tiny nooks and crannies with primer and paint. You definitely don’t want to over-sand as that can easily mess up the details. Good luck! When you are sanding between coats, what should that look like? Obviously you don’t want to take all of the colour off, but what is the result I should be trying to achieve after sanding between paint coats? Also- I am going to do a dresser white from a natural wood colour. Would you recommend more than one coat of primer? Hi Katie! You just want to rough it up a tiny bit so the other coats will have a surface to “grab” onto. It will also create a smoother finish. Just a very quick rub with a sanding block will do the trick, you don’t have to spend much time or use much elbow grease. As for primer, usually one coat is enough, but if you find that your wood is really porous and is soaking it up quite a bit, then I’d go for a second coat. Also, if your wood has a lot of knots, use wood filler to patch over those or they will bleed through. Hope this helps! Hello! Great job on the furniture! I’m in the process of doing my desk. I had a question. I hope it is not too silly. When I went to buy the finishing wax because I painted mine white it was only available in natural. Wouldn’t the light brown sealer ruin the white paint that I just put on? Hi Ashley! Your question isn’t silly. “Natural” is the one you want! It looks brown in the can but it goes on clear. Thank you so much! I was too scared to try it and ruin my work. Thank you again!! No problem! Just be careful not to put it on too thick. You should barely be able to see it go on. Apply it through a couple of layers of cheesecloth for best results, and buff with a clean white cloth. Good luck! I am about to repaint two dressers. one looks almost exactly like this one, but it has intricate carvings in it, and I want to remove/fill them in to make the piece less dated. any suggestions? I was thinking about sanding it and then using wood putty. (then begin the full sanding and painting process) would that work? Wood filler and sanding should do the trick. Use a good primer as the wood filler may absorb the paint and cause flashing (a duller appearance in that spot whereas the rest might look more glossy), but a coat or two of primer should prevent that. Good luck! Would you use this same method on metal. I am painting a file cabinet and was thinking of using the chalk paint but it is very expensive. Would the interior latex paint work on it? Hi Chevelle! No, I would not use this method for metal. The best paint for metal is spray paint, and I always use a spray primer first. Be sure to get the kind that specifies that it is for use on metal. You can use chalk paint, and I do know people who have used it on metal with good results, but I’ve never tried it myself. Good luck! I followed your instructions exactly. Taking the time to prep sand, prime, sand, and prime again. I gave it another sanding before applying the paint and sanded in between each coat (3). I used a foam roller to apply the paint. But, after it dried, I noticed that the surface was rough. The foam roller left dimples. I thought that a roller would leave a smoother surface unlike a brush that could leave brush marks. When I apply the paste wax sealer, will the surface then become smooth, or did I do something wrong somewhere along the way? Any thoughts or suggestions? Hi Vin! I’m sorry you’re having issues with your paint finish. The wax sealer will not smooth the finish, you definitely want it to be as smooth as you want it before you apply any sort of topcoat. A few things might be the culprit here. First off, I’ve noticed that if I am applying a high gloss finish, the roller marks/rough surface is much more prominent. Another thing that could be happening is that if you aren’t loading up your roller enough before painting (roll it many times to load it up and get started), then you could be removing some of the paint as you roll which will create a texture that you described. Work in small sections and reload your roller frequently — even more frequently than you may think is necessary. If you’re using a gloss finish I almost always recommend using a paint sprayer to get a really flawless finish. And if you are not using gloss but are still running into issues, you could use a sprayer anyway OR try a low nap roller instead of foam, and apply another coat or two until it all evens out. Another option would be to add a product like Floetrol to your paint which levels it and eliminates brush strokes or roller marks. Good luck to you! Hi Penny! Glad I could help! How do you prepare fiber board to paint? I have a small cabinet that the paint has come off of and the particle board is kind of swollen. I can’t find another piece to replace it so would like to paint it. Can’t find anything on how to do this. Hi Linda! You can use this same method, just be very careful when sanding and just do it lightly to rough up the surface enough for paint to adhere to. If the particle board is swollen, I don’t know of a way to repair that other than to just replace it, but paint might help camouflage it some or at least improve the piece for now. Good luck! Hi, new to painting stumbled across your article. I probably didn’t read this properly altogether, but so you don’t recommend polyurethane for white or lighter colors. What are the alternatives and do you have any brand suggestions? I love Minwax Polycrylic and also Minwax Finishing Wax Paste. Those are my personal favorite topcoats. Hope this helps! Followed all the steps, cleaned, sanded, tack cloth, primer, but when I went to sand down the primer (after allowing it to sit over night) the sand paper took off stripes of the primer… Not sure what my next step should be….has this ever happened to you? Any suggestions? Hmm, did you sand before priming? And are you just using very fine sandpaper on the primed surface? Maybe your sandpaper is too coarse. I would touch up the areas that were sanded off and then very gently smooth it with fine sandpaper when it dries, then paint. Hi Erin I have furniture that has a lot of very fine detailed cuts and edges that is very hard to sand, even by hand. How would you approach this. My thought was to skip the sanding in these areas and just prime and paint. Any advice? Hi Caleb! Yes, I would probably just prime and paint. Sometimes it’s just too hard to sand certain types of detailing. Good luck! Will this work if I have wood furniture that’s already painted? The wood is finished and then there are painted (and finished) wood drawers. I just want to paint the drawers a different color. They are black. Should I do several layers of primer if I want to cover the black better? Hi Megan! Yes, it will work. I would sand them enough to rough up the surface and then prime. It might take a couple of coats. You could probably get away with one coat of primer if you’re painting them a dark color. Probably two coats otherwise. I am going to try these steps on a dresser I will be painting white. You talk about sanding between each coat of paint. How long do you normally need to let a layer of paint dry before sanding? Thank you! I normally just follow the dry time directions on the can. Generally a few hours. I do let the final coat dry for 24 hours before applying a final topcoat/sealer. Hope this helps! I’m so glad that you found my post helpful! I’d love to see a before and after pic when you finish! Good luck. I’m painting a slightly used desk from black to white. The hardware on the 3 drawers are a dull gold & that I’d like to give them a color that”ll make them “Pop”. My color theme is turquoise & white. I like the color silver. What type of paint would you recommend for the hardware? or any other ideas? Appreciate it! I would use spray paint. I really like Rust-Oleum, personally, but any kind would be fine. Spray them with primer first, and then spray paint. Multiple light coats are better than one thick coat. It will look much smoother. Just make sure you buy the appropriate formula of spray paint for the material. (Ie Wood vs metal vs plastic, etc.) It should specify on the can. Good luck! Hi! If you use the polycrylic or finishing wax, is the application process still the same of the product you first mentioned? Also, do you just do one coat of the wipe on poly? I’ve seen some sites that say 2-3. What do you think is best? Hi Jenny! The application process for wax is different than polycrylic. You apply wax with cheesecloth and then buff with a white cotton cloth. For polycrylic, I usually apply it with a brush, and I do recommend at least 2 coats. If it’s a tabletop or a surface that will see a lot of wear and tear, I usually do 3 coats. Just follow the directions on the can as far as application and dry times. The painting process is the same either way though, before you reach the “Protect” stage of the project. Good luck! do you sand between your final coat of paint and your poly protection coat? I painted over a piece using latex paint. I didn’t realize the previous owner had used chalk paint and rubbed it with wax. the color that i put on is now peeling. what can I do? HELP it’s a huge piece!!! Oh no! I’m so sorry! Unfortunately the paint probably won’t adhere to the wax, so if it wasn’t thoroughly removed you might have to start over. I know that is such a bummer. Is it peeling all over? Or just in certain areas? If it’s just in a few spots you could try to sand those smooth and touch them up with paint, but if it appears to be a larger problem then you will have to strip off the paint and the wax underneath and paint it again. Good luck! I’m about to jump into my first furniture painting project. Do you normally work on the furniture outside or inside? I’d like to work under my patio outside since I know the sanding will make a mess, however, I’m worried about the moisture and humidity that could affect the furniture. Hello! I usually paint in my garage, but I’ve done it inside too. As long as it isn’t going to rain, you should be fine unless you live in an area with really high humidity in general. In that case, I would consider sanding outside and then moving it inside to paint. Good luck! Hi! Thank you for the step-by-step instructions! This is the first piece of furniture I’ve painted and it has turned out wonderfully! Definitely better than I expected to do. I am all finished painting and ready to apply the polyurethane but I’m not sure if I should sand the last paint job before applying or just put the protective layer right on it? I’d hate to ruin the final look of it. Thank you, again! Hi Julie! No, don’t sand the last coat of paint. Just add the poly! Good luck! Hi Patty! It’s very possible that it is solid wood with a real wood veneer, and you can use the same process to paint that as any other wood piece of furniture. The only thing is you will want to take extra care when sanding, because you don’t want to sand the veneer all the way off. Lightly sanding just enough to rough up the surface is the way to go. No need to heavily sand anyway if you are just painting, even if it isn’t veneer. You just want to give the paint a rough enough surface to have something to “grab” onto — nothing too shiny or glossy. Hope that makes sense! Just err on the side of lightly sanding and you should be fine. What type of sealant should i use on white funiture? Also, i love the semi gloss look but also was the furniture to have that dark countouring in the crevices without using chalk paint. What do you recommend? Hi Aimee! I usually use Minwax Finishing Paste Wax in Natural as a topcoat on white furniture, although Polycrylic is also an option. I steer clear of polyurethane due to its tendency to yellow over time. You can use semi-gloss paint and distress the edges, although if you aren’t painting over a dark piece of furniture you might considering staining the edges darker first so that is what will peek through. After painting, you can just take a sanding block and distress the edges and areas that would naturally distress over time. Chalk paint is super easy to distress but you can do it with any paint. Hope this helps! Can I follow these steps and directions to paint a stained dresser? Hi Joelle! Yes, you can use this tutorial for stained furniture. You will just want to sand enough of the topcoat to rough it up a bit so it isn’t too glossy, so the primer has something to “grab” onto. If you are painting over mahogany stain, you’ll want to use a shellac-based primer to prevent bleed through. Good luck! Hi Courtney! I don’t bother with the tiny crevices. You don’t have to go overboard with the sanding anyway, especially if you’re just painting. The goal is just to rough up the surface enough for your paint to have something to “grab onto” if that makes sense. You want to rough up the glossy finish so the paint doesn’t slide off. Just try your best and I’m sure it will look great! Thanks, Tonya, and good luck! Thank you! This is so helpful and your work is beautiful! Hi Erin, this has been a wonderful tutorial. Thank you! Question: what do you use to wipe on the poly? Do you use cheesecloth for that as well? Hi Melissa! I use a plain white cotton cloth. An old white tshirt will even do. So, how do you paint not real wood objects? I have something I want to paint, but scared, because it is not real wood. Hi Stefanie! It depends on what it is you are painting. If it’s laminate, you can paint it the same way. Just be careful when sanding, and do it very lightly, as you don’t want to sand off any veneer or damage the surface. Just lightly roughing it up a bit will be enough for the paint to adhere to the surface. Hope this helps! Thank you Kelly! So glad you found this post helpful! How long should I wait for the paint to dry in between coats before I sand? I would follow the instructions on the can, which usually say 2-3 hours or so. What brand of paint would you suggest purchasing to paint furniture ? It really depends on what look you are going for. I usually use interior latex and my favorite brands are Benjamin Moore and Sherwin Williams, but I’ve used Behr Marquis with good results too. If you want more of a shabby chic or distressed look, then I would go with a chalk paint. FolkArt Home Decor Chalk is good, although there are many brands on the market. Milk paint is another popular option if you want an aged/distressed chippy look. If you’re using latex, use a good primer first. I would go with Kilz or Zinsser. Hope this helps! Thanks for the guide! Is it okay to sand the furniture the day before painting? Or is it best to paint as soon as your finished sanding? Hi Carolyn! Yes, and yes. You can wait as long as you want to after sanding before you paint. Just make sure the surface is clean and free of any dust or debris before you paint. Loved the article! I’m painting a bookshelf I had made for my daughter’s room. The color is a light gray-would you recommend the Minwax Poly Wipe-On with light gray? I would probably use Minwax Polycrylic for that instead. It’s water-based, lower odor, and works really well on top of paint. It also comes in a variety of finishes (satin, semi-gloss, gloss). Good luck! So i was thinking bout repainted a cabinet my aunt just recently gave me but i only have spary paint with primer…can i use that or should i get regural paint? It just for my my bathroom? This will b my first piece n i am nervous but excited at the same time? Hi Alonni! I would use regular paint with a good primer underneath. I would also seal it well, especially if it is going in a bathroom where there tends to be higher humidity. Good luck! Hi Kathe! Sorry for the confusion! That photo is just showing the tack cloth after sanding. I had not yet primed that surface. You do not want to sand off your primer, you simply want to lightly rough it up. Good luck! Erin you are a blogging angel! Thank you for replying so quickly! Just saved me from going to hell and back! I’ll re-prime the piece I over sanded! Hi I want to paint my black bed room set a gray color do I have to strip the color black off completely before I repaint it? No, I would just sand it to rough it up, prime it, and then paint. I’ve been working slowly painting a buffet for the past two weeks that has a lot of fretwork- it was brand new and white and I’m painting it navy blue. I have painted/sanded four coats so far and it’s finally looking dark- whew! I think I’m going to do one fifth and final coat but would like your advise… I noticed that sometimes I ended up with roller marks across the long top of the buffet- I’m using a small foam roller made for cabinetry. I’m trying to do thin coats but perhaps they are too thin? Do you think I need a bit more paint and then it would level off better? I also read one tutorial that said maybe water down the paint a little, or use Floeteol. I just want this to be the last and best coat and not have wasted my time! Also, will the protectant potentially hide any marks, or only make them worse? Hi Larisa! You could try a little bit thicker coat, but sometimes those foam rollers do leave marks. I’ve never tried Floetrol but I know some people who swear by it, so might be worth a try! Another option is to use a paint sprayer to avoid any marks. Good luck. Thanks for the reply- I got the fifth coat on and just made sure the roller was filled with paint and it worked well. Last question- just bought the Minwax Wipe On Poly in Satin that you suggested. The can suggests 2-3 coats and sanding in between. Is this what you suggest for painted furniture as well? Many of the product reviews on Amazon say different things- sanding/no sanding, up to 10 coats (! ), etc. Not sure if it’s different for seating just wood, vs painted furniture, and appreciate your advise for this final step! Yes, that’s what I usually do. I normally use 2 coats on the sides and 3 coats on any surface that will see a lot of wear and tear (tops mostly). Hi Erin, Thank you so much for the step by step instructions. I’m attempting my first furniture painting project and I have a question. I bought the oil-based Kilz primer you recommended. When my husband saw that he said I should use the primer we already have which is Kilz 2 latex. Will there be any difference? He thought the latex would show less brush/roller strokes and cut down on my sanding but I know you specifically recommended the other one. He does not do any kind of furniture work but he is very handy and rebuilt our house from the studs. So, I’m coming to the expert for clarification. 🙂 Thanks! Latex is fine! As long as you aren’t painting over oil-based paint, you’ll be fine. Hi! I recently finished my first painting project but am not happy with the finished product. I used a sprayer to get a frush stroke free finish but then when I coated it with the Minwax Polycrylic it left terrible brush strokes. Any tips how to get rid of those? I have a hand sander also, but the 220 grit i’ve been using between coats took off the paint also. The key to Polycrylic is to apply extremely thin coats. If the coats are too thick, it will show the brush strokes. You may have to just lightly sand with extremely fine sandpaper and give it another try. I normally follow the instructions on the can since different brands and formulas can vary, but generally for latex paint I wait about 2-3 hours. What I didn’t think about was wiping a table that’s a matt finish paint. It’s pourus so I need to do a satin top coat. What should I use and do I have to start again?! I usually use Minwax Polycrylic as a topcoat. It does come in a Satin formula, so you could try that. Hi Erin. I recently purchased a new beige upholstered panel bed. Want to modernize our dressers and I am torn what color to paint them? They are old traditional espresso colored furniture. Hmm, what other colors do you have in the space? Hi! In the second photo (with the ‘Welcome to our Home’ sign), I’m wondering what the wall colour is. Beautiful work! So impressed with all of the pieces! Thanks Annie! It’s “Nocturnal Gray” by Benjamin Moore. This is so useful thank you!! How long my should you wait after painting a layer of paint before sanding and painting again? I usually wait a few hours. I generally follow the instructions on the can about when to add a second coat, as it can vary depending on the product. Your furniture pieces look great! I have been trying to sell an old (but beloved) set of dressers. After viewing your article I am going to try to salvage them. Thank you for your inspiration! Thanks, Shauna! So glad you found the post helpful! Hello Erin! Your work is beautiful and tutorial is very helpful. I just want to know if I can paint wooden furniture with acrylic paints? Will they peel off? Thank you! I probably wouldn’t. Not sure that they would be durable enough. If you try it, I would be sure to use a really good primer. And let me know how it goes! Do you sand by hand or do you use power tools, like an orbital sander? I do both, but generally an orbital sander for larger surfaces. So glad I found this article! We’re doing our first piece of furniture ever, a desk for our daughter. I’m a little nervous about it, wish us luck! Good luck! Hope it goes well! When sanding in between coats do you wait for each coat to fully dry then sand down and repeat? I’ve seen a vintage wooden bed that I love but the wood is far too dark and I have no idea how to paint it !! Yes, wait for it to fully dry. Lightly sand between coats, just enough to barely rough it up. Very nice work! I have to ask, on that black and white piece. Is it satin, semi gloss, or gloss? Thanks! This was SO incredibly helpful. Thank you for sharing this post. I am currently working on a dresser with chalk paint–so much fun to paint with! Thanks, Courtney! I’m glad you found it helpful! This was amazing. Perfectly put together. And I am a girl who needs things dumbed down. Thank you so much! Now I’m off to get my hands dirty. What kind of prep do I need to do if I’m painting over a piece that I previously painted with latex paint? Just lightly sand to rough it up, then prime and paint. The primer you use will depend on the type of paint you are using. For interior latex paint, I use a water-based primer. I recommend Kilz or Zinsser. Hope this helps. Wish I’d found this sooner! I have a question, I have a table that has previously been sanded with a coarse sandpaper. That’s it, just sanded, but there are a lot of fine scratches on it now. If I want to actually paint and finish it do I need to worry about those scratches? Would a finer sandpaper help buff them out??? I would try using fine sandpaper and see if you can smooth it out a bit before painting over it. Thanks so much! Followed your instructions to a tee and am really happy with how my painted dresser project turned out! I am still letting the wax set for the next couple days and I cannot wait to put some new hardware on the drawers! Awesome! I’m so glad you found the tutorial helpful. Oh my god! It’s been a while. I remember when I read this post few years ago. I was I newbie and since then I started doing my workshops in Edinburgh. Can you believe that? Thank you Erin. The journey was long but now I teach others how to paint furniture instead of working in the bank, something that I hated doing. Now, all furniture in my house are second hand, repaired and repainted! Hi Caroline! Thank you so much for your message. It made my day! I am SO happy to hear that you are now doing something you love, and I am so glad that you found my tutorial helpful. Thank you for letting me know! That really is awesome. Take care! Oh my goodness. This is such great information. I’m going to try my hand at painting this weekend and was terrified until I read this. Everything I needed to know in one handy location. Than you! So glad you found it helpful! Thanks! Thanks, Anita! Hope it went well! May I ask what paint you used for the blue dresser? It’s absolutely stunning! Thank you! It’s Benjamin Moore Summer Nights. Just want to say thanks for your simple yet comprehensive instructions! My dresser now looks amazing! And if so what kind of sealer ? I usually use latex paint on furniture, and yes you could use acrylic for the picture since both are water-based. I like to seal mine with Minwax Polycrylic. Hope this helps! Do you recommend 2-3 coats of sealant as directions say? I’m using polycrylic. Yes, I do. I typically will use 3 coats for the top of a piece of furniture that’s going to see a lot of wear and tear, and 2 coats for the sides/front. Do you paint the drawers inside and out or clearcoat? I don’t paint the inside of the drawers, no. Just the fronts. This was extremely helpful. I have a dresser Im thinking of repainting. I have everything ready except the paint. How do you determine how much paint to buy? It seems more complicated then figuring out wall square footage. A quart is usually plenty for me. So I’ve painted furniture before but never properly and was looking forward to how great this would come out! I painted two coats of an exterior latex semigloss on sanding between coats. After it set for over 24 hours I did the wipe on poly as suggested. I did one coat intending to do 3 so it would be nice and protected. That was 2 days Ago and the first coat is still tacky. I added a dehumidifier to the room yesterday as I live in Louisiana and thought humidity might be at play. Any advice on what’s gone wrong and what I might try now? Hmm. That’s strange. I’ve never used exterior latex on furniture before, but I don’t see why it would be taking so long to cure. 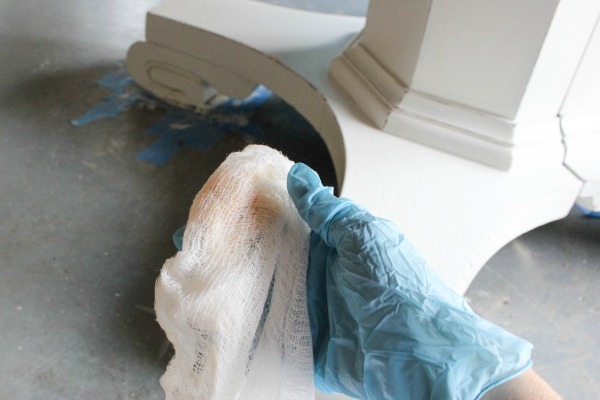 I generally use interior latex and I really like using a water-based topcoat like Polycrylic on painted furniture just since it’s easier to clean up. Polyurethane is pretty indestructable as a topcoat though. Usually if it is tacky it can mean that the layer was applied too thick, in which case you may just have to wait it out for it to cure. The coats must be applied very thinly. Humidity could definitely play a role too. I would give it a few more days and if you’re still having trouble, maybe sand off the topcoat, add one more coat of paint, and try again with water-based Polycrylic. Sorry you are having issues! I know that’s frustrating. Good luck! Thanks for a great step by step tutorial! I have a console table being made and I’m planning on painting it antique black…however I want it a flat/matte finish. I do not want any satin sheen tonit. What do you recommend for a paint? I would use chalk finish paint, which is very matte. Good luck! amazing idea and great post thank you. Can you describe the problem so I’ll have a better idea of what’s happening? Thanks! How long do you wait in to sand the coats of paint? Some paint stays tacky for like a day and this would take me forever to finish if I had to wait a while day to sand in between coats. Usually a couple of hours. When the paint is dry, you can sand. If you’re using interior latex it shouldn’t stay tacky for that long unless you have extreme humidity. I would definitely use an exterior semi-gloss and probably a polyurethane but do check to make sure whatever type you buy is suitable for outdoor use. Good luck! Beautifully well written and beyond helpful – thank you for sharing this awesome guide with us Erin! I loved this article. My daughter has my old bedroom furniture and it definitely needs a makeover. There is some type of coating on the top surface which I assume was there to prevent damage. Can I sand that off and paint over it? You should be able to, yes. Hi. Great article. How much primer and topcoat would you recommed I buy for a wide 5 drawer chest, assuming I am painting the outside of the drawers only and allowing for 2 coats of primer and 2 topcoats. If successful I might do 2 or 3 pieces. I usually buy a quart of each and it seems to be plenty. Just a very light sanding to give the next coat something to grab onto. Not a dumb question! Great article! I’m planning to paint a piece of laminate furniture soon. Did you ever get around to writing a post about painting laminate? I don’t have an article about it, but you can use the same process. Good luck! I’m trying to figure out which paint for wood is the best for painting my vintage wooden chairs. I’ve already read about a lot of other paint brands here that seem to be great: Renaissance Chalk Paint , Rust-Oleum, Annie Sloan and even more. It’s overwhelming – so many options are out there so I’m confused which one to choose. Actually I’m afraid to spoil my chairs by choosing the wrong option. Could you recommend something please? Thanks! It really just depends on what look you are going for. All of the paints you mentioned are good. I usually prefer a more modern look so I like interior latex paint, but Plaid has a Home Decor Chalk finish paint that I have used and liked too. You could always test a few different ones on some scrap pieces of wood first to see which look you like best. Good luck! Hi Erin this is exactly what i needed to know. It’s very helpful and now I know how much time I could have wasted. I would have sanded once and painted. Period! I’ll be trying this soon for my new room upgrade. Thanks again and can I get these brands in the UK? I’m not sure if these brands are available in the UK actually, but I’m sure you can find products of equal quality. Sorry I’m not familiar with the UK market! I sanded my final coat of paint and it looks scratched. What can I do to fix it and look great. Hi Darlene! You don’t want to sand your final coat, only the previous coats. I would sand it smooth and add another coat and then leave it to cure or add a topcoat like furniture wax or polycrylic. Good luck! I loved what you have shared with us. I haven’t painted much furniture before, but now I am planning to paint my furniture. These are some great tips, that will help me a lot and others as well. I’m pinning so I’ll have it available when I need it! Thank you for the tips! I loved them. Looking forward to another of your blog. WONDERFUL tutorial. Thank you so much for sharing. I do have a question for you. I am in the process of re-painting a night stand for my son. After I apply the polycrylic, do I need to use the fine grit sandpaper one last time? Or once I apply poly, am I finished with the sanding? Poly is the last step. No sanding after that. Good luck! Hi! Thanks so much for this info. I’ve just painted my first project. A table and 4 chairs. I used a wagner spray gun. I sanded A LOT because the chairs were pretty shiny. I used sherwin William’s primer and paint. I sanded after priming and between each of my 3 coats. I waited 7 days after using my primer(all water based). This was sherwin Williams’ recommendation. All seemed good, so I sanded and used a tack cloth to clean and then sprayed my first coat. I waited a few days(my day off) to sand and do a 2nd coat and then a few more days to sand and do a 3rd coat. After bringing the table inside, I noticed that the finish looks very uneven. Dull in some spots, shiny in others. Also a small amount of orange peeling. But, I was tired of this project and wanted my car space back in the garage. So I applied the minwax finishing wax and thought it might help with the unevenness. It didn’t. This only occurred on the top of the table. The base of the table looks perfect. Any thoughts on what I can do to salvage this? That is so strange. Hmm. You’ll have to sand off the coat of wax before doing anything, but I would try to add maybe another coat of paint to see if it helps the unevenness. Did you water down your paint at all before using the sprayer? The orange peeling is odd though. Do you know what it was stained with before? Not sure what it was previously stained with. The orange peel is probably poor technique or improper settings on my sprayer. I am LOATHE to do anymore sanding. Have you ever tried a deglosser before? I’m wondering if I can use that instead of sanding to get the wax coat off before repainting. I appreciate your help! I’ve never used a deglosser but I know people who have had luck with them. Might be worth a try. I’ve used paint stripper (Citristrip) but never tried anything on wax before. I wish I could be of more help! Good luck. Let me know how it goes!